Fair Or Foul? Baseball Expands Use Of Instant Replay : The Two-Way OK, fans, it's time to weigh in. Is it good news or not that baseball is dramatically expanding its use of instant replay in a bid to correct blown calls? 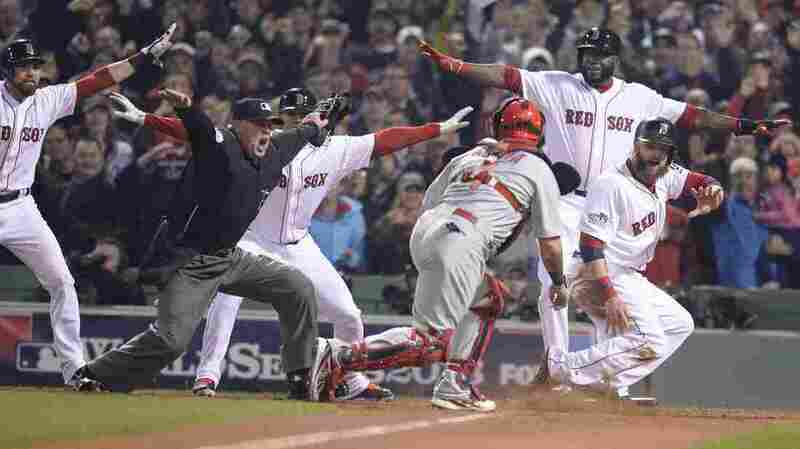 Upon further review ... Boston Red Sox baserunner Jonny Gomes, right, would still be safe at home during last fall's World Series. After balking for years, Major League Baseball is dramatically expanding its use of instant replay in the hope that blown calls will be corrected by umpires in a New York City studio who will be able to review them from multiple angles. "Until now, video review was only allowed for boundary calls involving home runs and happened at the discretion of the umpires, who would leave the field to look at replays and then return to make their decision known. "The on-site officials will not make the call, however. All reviews will be conducted at the Replay Command Center at MLBAM headquarters in New York. Two additional four-man umpiring crews will be hired and umpires will be rotated through New York to review video feeds. Every ballpark will have a designated communication location near home plate. There, the crew chief and at least one other Major League umpire will have access to a hard-wired headset connected to the Replay Command Center. The decision of the replay official in New York will be final. "Another big change is that teams will be allowed to show replays, including those of disputed plays, on their in-park video boards." Is it a good idea for baseball to expand its use of instant replay reviews? This means Major League Baseball is joining most other professional leagues when it comes to the use of instant replay. "The NFL, NBA, NHL, some NCAA sports and major tennis tournaments all use a form of replay, and even FIFA and the English Premier League have adopted goal-line technology for soccer," says The Associated Press. "The so-called 'neighborhood play' at second base on double plays cannot be challenged. Many had safety concerns for middle infielders being wiped out by hard-charging runners if the phantom force was subject to review. "Ball-and-strike calls can't be contested. Neither can check-swings and foul tips. Nor can obstruction and interference rulings — those are up to the umpires' judgment, like the one at third base in Game 3 of the World Series last October that sent St. Louis over Boston." Those who think baseball games already last too long, though, may not be happy to hear about something that could add a few more minutes — at least — to the games. We've got a question for everyone that we'll hold open until midnight ET on Saturday.